Peace, Love, and Nutella Cookies are extra special. A combination of chocolate cookie and chocolate chip cookie into a fun and meaningful nibble. This cookie is what I love about life – what I love about being a mother and what I love about cooking. I am home today with both my kids sick. After a trip to the pediatrician, we were tooling around the grocery store waiting on the prescription to be filled, and I asked my daughter if she felt like making anything – maybe a new cookie? This cookie was her idea. So, here I am, a mother in the middle of ‘one of those days’ dealing with fevers and vomit and potty training to boot, being the human napkin…but then I had the most magical experience with my girl creating a new cookie. And they are stellar. 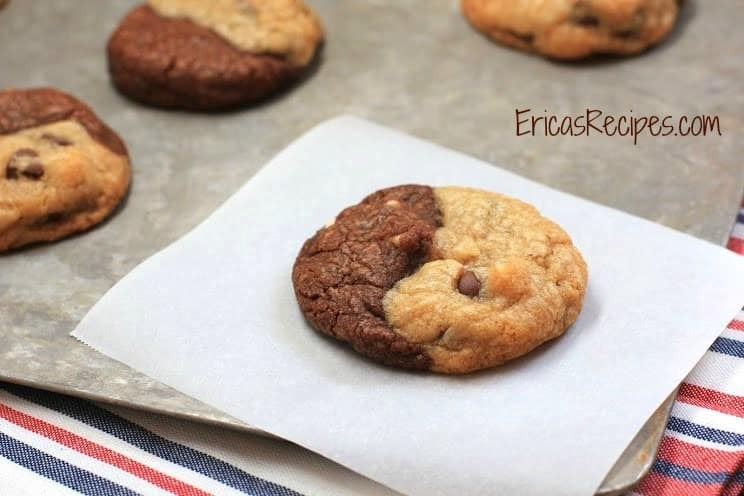 For this cookie, two cookie doughs are made then shaped together into the yin and yang. Make the Nutella and White Chocolate cookie dough: in a medium mixing bowl, combine the dry ingredients (i.e. the flour, salt, baking soda, and cocoa powder). Separately in a large mixing bowl, combine the wet ingredients – the shortening, sugar, brown sugar, vanilla, Nutella, and egg. Add the dry ingredients to the wet and stir to incorporate. Add the walnuts and white chocolate morsels. To form the cookies, take a ~3/4-inch ball of each cookie dough. Shape each ball into a tear-drop shape. Press the two together to for the yin and yang. Flatten the shaped cookie a little on the cookie sheet with your palm leaving it ~1-inch thick. Bake 10-12 minutes. Yields: ~3 dozen cookies.